Sri Padmavathi Srinivasa Kalyanam as said in Bhavishyottara purana. Once Srinivasa put on a fine dress and started for hunt. He chased an elephant and wandered a long distance and ultimately entered a garden. A beautiful young maiden and her companions, who were plucking flowers, run away on seeing elephant and took shelter behind a tree. This maiden was the foster daughter of King Akasaraja and was named Padmavathi. This Akasaraja and his younger brother, Thondaman, were the sons of Suvira, a king of the lunar race. Akasraja found Padmavathi concealed in a lotus while he was getting a piece of land ploughed in order to construct a Yagasala. Being childless, he took this child home, named her Padmavathi and brought her up. Subsequently, he had a son, named Vasudeva. Srinivasa approached Padmavathi and described himself as Krishna, Son of Devaki and Vasudeva, and brother of Rama and Subhadra. He asked for her hand. The attendant maidens of the princess got wild and pelted stones on the Lord. His horse was hit by them and fell down dead. Srinivasa departed from there taking a northern direction. The lord returned to his abode in the ant-hill and lay down in great grief. 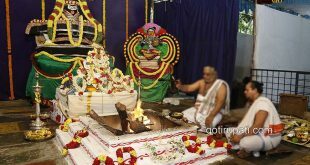 Vakula, who attended upon him, appeased him by many courtesies and found out that he had fallen in love with Padmavathi. 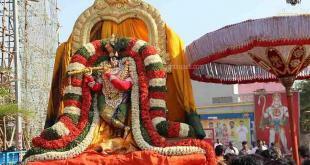 The Lord asked her to go to Akasaraja and negotiate his marriage with Padmavathi. Even before Vakula could reach the King’s abode, he himself went there in the disguise of a gipsy woman and persuaded Akasaraja’s queen, Dharani, to give her daughter, Padmavathi, in marriage to Srinivasa. Padmavathi was also struck by love and was pining for the young man she had met in the flower garden. When Vakula reached the king’s palace the ground was already prepared and the marriage was setlled. Srinivasa set out with all the gods and goddesses as his relations and married Padmavathi. Thondaman built a temple: Very soon after the marriage, Akasaraja died and his brother, Thondaman, and Son of Vasudana, fought for the throne. Srinivasa interfered at the instance of Padmavathi and divided the kingdom between the two disputants. 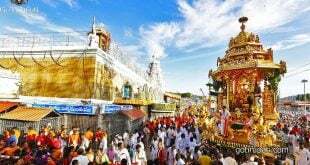 Thondaman got the Thondamandalam part and Vasudana obtained the Narayanavanam part of the kingdom. This Thondaman was Rangadasa in the previous brith. So, the Lord commanded him to build a fine abode for His residence, Thondaman constructed a temple. The Lord lived in it with great satisfaction. The king had many vehicles made and performed a number of Utsavas for the Lord.